Barbara Guest, June 6, 1998, at friend June Felter's house, Berkeley, in front of Felter's painting. Photo by June Felter. Cover of Hannah Weiner's notebook. 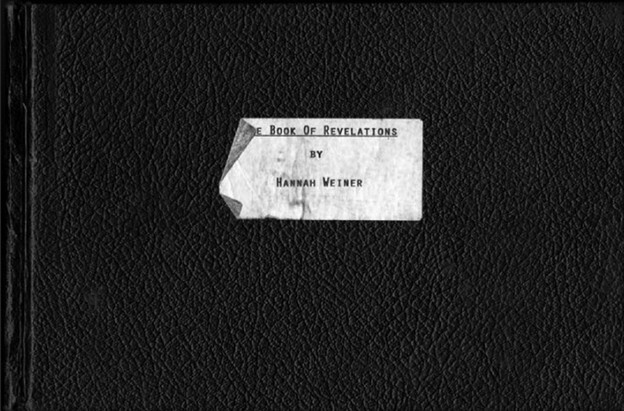 Hannah Weiner’s The Book Of Revelations was composed in 1989 or shortly thereafter in a notebook given to the poet by her friend and artistic collaborator Barbara Rosenthal. This new virtual edition, assembled, annotated, and introduced by Marta L. Werner, offers a facsimile of the notebook’s pages, a diplomatic transcript of the work, and a searchable text transcript of the notebook, along with extensive notes and commentary.